I wish I could take credit for this, however, credit goes to executive chef GREG PROECHEL of New Your’s Ferris restaurant. This recipe was a featured article in People Magazine. I did change it up a bit and the items I added are indicated with an asterisk. Heat 1 1/2 Tbl olive oil in a large cast iron skillet over medium high heat, swirling to coat. Add brussels sprout leaves; cook, stirring occasionally, until crispy, 1-2 mintes. Remove with slotted spoon; drain on paper towels. Add remaining 1 1/2 Tbl olive oil to skillet on medium high. Add broccolini, and cook, turning occasionaly, until charred and tender, about 2 minutes per side. Remove broccolini from heat; season with remaining 1/8 tsp black pepper and 1/4 tsp salt. To serve, spread yogurt mixture onto a platter, and arrange broccolini on top. Sprinkle with brussels sprout leaves, cashews, garlic, parmeasan, grapes and lemon zest. 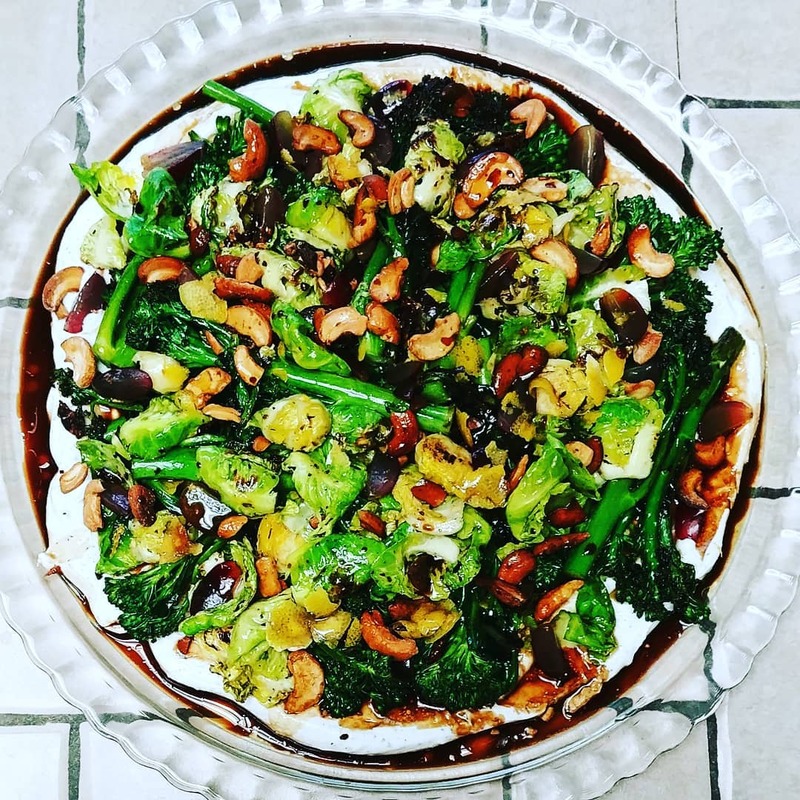 Drizzle with 1/2 cup of the balsamic vinaigrette.